In our iPad 2 preview I speculated that Apple might have moved entirely to Qualcomm for the iPad 2 baseband, and the most likely guess was to the same Qualcomm MDM6x00 used in the Verizon iPhone. Turns out that I was only partially right. Looking at the difference in weight between the Verizon and AT&T models on the Apple website should've been the dead giveaway, but I initially suspected the reason was more area dedicated to power amps for the GSM/UMTS version. Black RF window at the top, even on a white iPad. The Verizon iPad 2 shares the same Qualcomm MDM6600 baseband as the Verizon iPhone 4. The AT&T (GSM/UMTS) iPad 2 on the other hand uses the same Infineon, ...errr Intel X-Gold 618 baseband as the GSM/UMTS iPhone 4. It's interesting to see Apple using two different basebands when one could have covered both CDMA2000/EVDO and GSM/UMTS, and faster HSPA at that rate. The X-Gold 618 just isn't super impressive anymore in a world dominated by HSDPA 14.4 and 21.1 compatible basebands. That said, it's a welcome improvement from the X-Gold 608 shared between the iPhone 3G, 3GS and GSM/UMTS iPad, which lacked HSUPA entirely, and thus had a maximum upstream rate of 384 kbps (UMTS speeds). The cellular enabled versions of the iPad 2 still are easily picked out by the black plastic strip at the top which is an RF window. 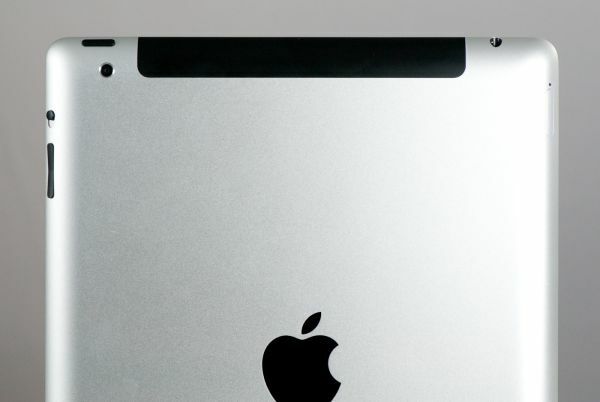 Curiously, the color of the RF window is black even on the white iPad models, which seems a bit un-Apple. Maybe black made more sense since white plastic might eventually show some discoloration. Through testing the window seems to also be used for WiFi in addition to cellular. 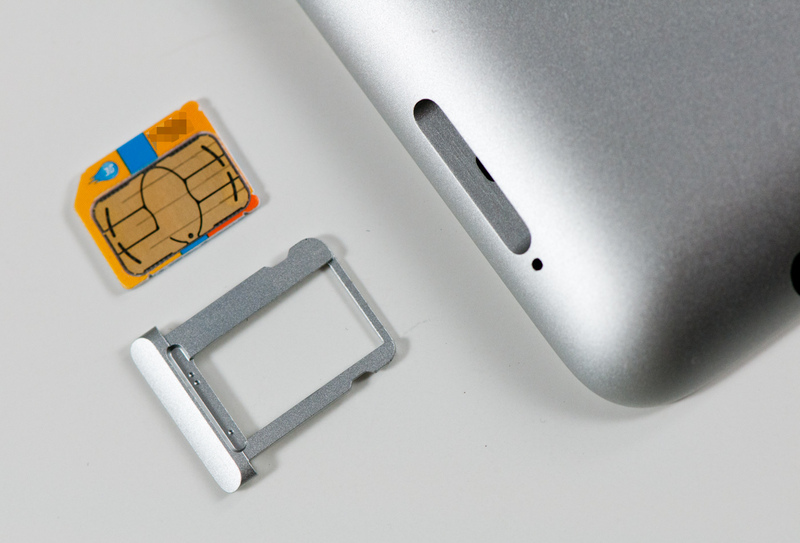 The GSM/UMTS version has a microSIM slot and comes with a SIM ejector tool in the package. I found the microSIM incredibly difficult to eject on my AT&T iPad 2 compared to every other iDevice. You have to insert the ejector tool normal to the curved surface, which ends up being at an angle of nearly 45 degrees with respect to the back surface. It isn't how I expected things to work, and the tray itself is a bit awkward. 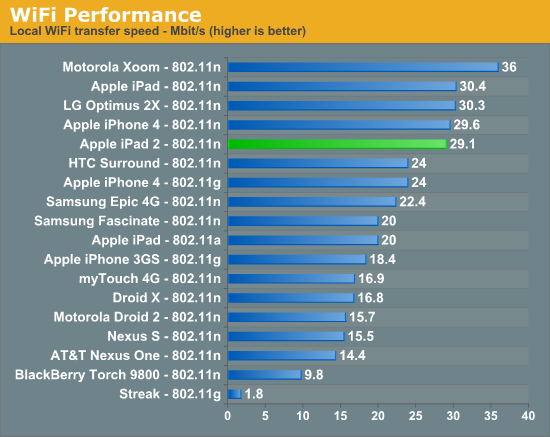 I carried around the AT&T version of the iPad 2 and ran over 150 speedtests using Ookla's speedtest.net application. I averaged throughput of 2.76 Mbps down and 802 kbps up, with latency of 390 ms. Anand carried around the Verizon version and saw downstream speeds averaging 872 kbps down, 434 kbps up, and latency of 382 ms.
Pricing between the two providers is interesting. It appears that Verizon was careful to not compete with AT&T at the same data package points, instead targeting data packages other than the two 256 MB and 2 GB bundles AT&T already offers. At the same time, pricing at 3 GB on Verizon is exactly where you'd wind up should you run over 2 GB on AT&T and incur the automatic $10.00 overage charge. Interestingly enough, whereas AT&T bills you automatically when you run over your data caps, Verizon simply stops and lets you add more data before the billing cycle ends. It's an interesting distinction, certainly competition is good. In addition, there doesn't appear to be any activation charge for either AT&T or Verizon. So which of the two is the one to get in the US? Ultimately the decision about which is "better" is really a function of local coverage profile, speeds, and how much data you use (which will determine your pricing). If you're an iPad 1 AT&T user and used unlimited, you also have the option of grandfathering it in for some time as well. Unless you’re in an overloaded metropolitan area, AT&T 3G data speeds are undeniably faster. At the same time, Verizon has more EVDO coverage that, while slower, is generally more consistent. Verizon’s pricing also includes heavier data numbers than AT&T does, so if you’re looking for something to completely replace a notebook with and intend to not use WiFi, that’s a fairly big draw. Speaking of data use, I find the fact that the “Post PC” era includes implicit data caps (neither Verizon nor AT&T offer any unlimited data iPad packages to new customers) somewhat disturbing. I burned through just shy of 1 GB of my 2 GB AT&T plan in 3 days of use. By the time I got finished writing everything on my review sections, I had already used more than half. Words cannot express my frustration - nay, rage - at the telecom industry's calculated assault on unlimited data plans, first in the mobile space, and now alarmingly with terrestrial DSL. Glass caps on both have always existed (200 or 250 GB for cable, 5 GB for essentially all mobile), but unless you clearly were abusing it, nothing happened. This move to tiered billing is a much more alarming trend. The above screenshot coupled with my use patterns (I have under 37 MB per day for the rest of the month? HA!) is precisely why I can't possibly see myself using the iPad 2 on a day to day basis. I hate watching a meter, but at least I do it. The problem isn't so much the number so much as the psychological effect of knowing you're eventually going to run into the celing. The iPad 2 uses the exact same 802.11a/b/g/n WiFi + Bluetooth 2.1 EDR stack as its predecessor - the BCM4329. Like the iPad 1, the iPad 2 has 65 Mbps (long guard interval, 20 MHz channel, 1 spatial stream) 802.11n support on both 2.4 GHz and 5 GHz. Essentially WiFi speeds and behavior close to the AP is exactly the same as it was before. I’ve seen other WiFi stacks on mobile devices with “802.11n” support provide short guard interval 20 MHz rates of 72 Mbps, but nothing above, yet, so it’s fair to say that the iPad 2 WiFi authentication rate is about par with the competition. That said, Bluetooth 3.0 is already here on a bunch of other devices. Unfortunately, WiFi range on the iPad 2 is noticeably less than its predecessor, and throughput slows down much earlier on the iPad 2 than it does on the iPad 1. I tested with a WiFi - 3G (AT&T) model and found that I’m able to make it further away from the AP by a good 10 meters or so, but throughput even after you drop one WiFi bar on the iPad 1 is continually better than on the iPad 2. WiFi throughput also tells a similar story, it just isn’t quite as good as its predecessor. It’s a bit unfortunate since Apple certainly could’ve used this refresh opportunity to be the first to introduce a two spatial stream 802.11n device. For now, the wrap up with regards to the iPad 2’s WiFi performance is that close to the AP, things are just like they used to be. At the edge of WiFi coverage, the iPad 1 edges out the iPad 2 at maintaining higher negotiated throughput and actual speeds.